Imagine you are in a large circle with you being in the center. Take a step and the circle moves with you. Always stay in the center of your circle. This is the foundation of being in the center. 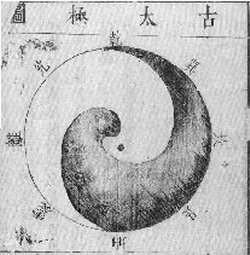 By using circles in combination with the guiding and controlling of the total movement (including that of your opponent), into a flow to one center, the art of Aiki can be practiced without seriously harming the opponent. Pain is not used to inflict injury, but rather to guide the movement to a common goal. The main purpose is to neutralize and/or immobilize the opponent and to do this quickly and efficiently. However, Aiki-jutsu-do can be used to inflict injury if the situation demands it. Always be careful with this, control the movement. A single correctly performed technique can have serious consequences for the opponent. Always consider this. Be the master! Even after you have taken control of your opponent's center, you are still in control of your own center, as well as your opponent's center. In Aiki-jutsu-do most movements are circular. You use the circles of your wrist, elbow, shoulder, waist, head, knee and your entire body. All these circles should be connected to one center. If your center is balanced, your body is balanced. By becoming one with the center of an opponent, and taking control of it, their center becomes your center. And you control both centers. The action of uke (opponent) and your harmony with his/her movement results in uke ending up in a dependent situation. Their balance is now depending on yours and you can guide uke in any direction without using any force whatsoever. A good defense consists of perception evaluation decision reaction. With regular training these phases can be performed automatically and almost at the same time. This is the goal of every martial artist. At the highest level the defense as well as the counterattack have already begun when the incoming attack is not even fully deployed. You can quickly and smoothly change from one strategy to another. This becomes extremely important when dealing with multiple opponents at the same time. Practice the heiho regularly and shape it into a second nature. The first moment of physical contact with the opponent is the stepping in. Your Ki is activated and your focused mind thinks and projects forward (even in going along a launched technique). Stepping is one of the most important parts of Aiki-jutsu-do. During this phase you evade, extend, surprise and take over uke's center. By extending the opponent's movement to a sufficiently modified direction, uke will miss the target and end up out of balance. Even better, uke ends up being dependent on you for his/her balance. By using circular movements every forward force can be rounded and its course deviated without much resistance. By missing the target and receiving a little pressure from you, uke can be brought into a circular path to a destination chosen by you. Once the attack has been rounded and extended, uke has no more control over the event. All control is now in your hands and by using the Aiki-jutsu-do techniques, the attack can be deferred and guided to a common goal, usually the floor. During the extension you must continuously feel uke's Ki. By drawing out uke’s instinctive and unconscious movement, true Aiki occurs. When this happens, uke unconsciously follows the flow of the harmonized Ki. When we apply power to the stimulus we introduced to uke, however slightly, uke will become aware of this power and resist to move in a certain direction. If that is the case, relax, feel the path of least resistance, and change the chosen technique to one more appropriate, again lead by Aiki, not physical strength. Flow as a river!